“The faster I go, the behinder I get.” I can’t recall the origin of that quote- perhaps from Alice in Wonderland? It certainly fits this time of year. 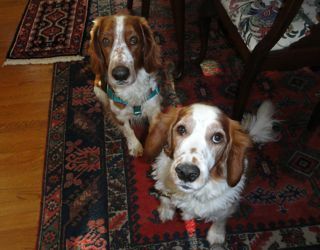 I am looking forward to spending time with family, dressing Alex and Baker in their jingle bell collars, and counting my many blessings. To all my readers, thank you for your support and friendship. May you have a peaceful and happy holiday season with your loved ones. 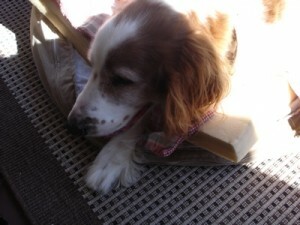 As part of the Saturday Pet Blog Hop hosted by Two Little Cavaliers, here is one of my favorite dog poems of all time. Enjoy! now boast a new hole in each of the toes. and now, although splendid, is missing some limbs. I catch them and hold them. Be good I insist. They lick me, then run off to see what they’ve missed. and teach us that joy that should come with this day? and tell us that Christmas is all about love! To all my readers, thank you for your support and friendship. May you have a peaceful holiday season with your loved ones. Here is one of my favorite dog poems of all time. Enjoy! 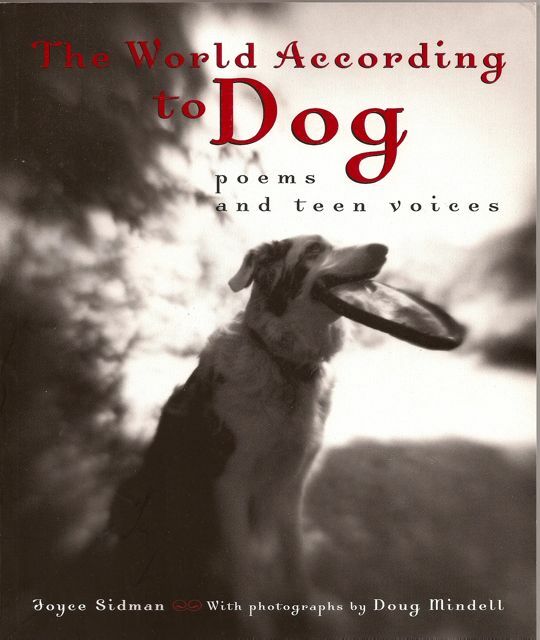 As I collect both dog poetry and dog photos, I was delighted to recently discover The World According to Dog; Poems and Teen Voices by Joyce Sidman, with photographs by Doug Mindell (Houghton, 2003). 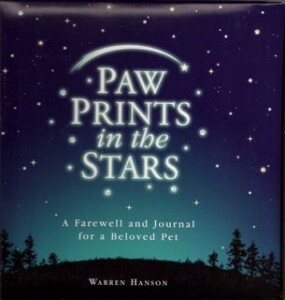 The genesis of this lovely book was poems inspired by the author’s dog, which she wrote when going through a difficult time. 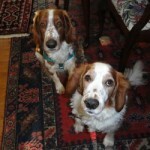 The author’s poems are interspersed with brief essays and photos of their dogs submitted by teenage authors in response to the author’s invitation on teen listserves and web sites. Ms. Sidman’s poems are illustrated with stunning photos by Doug Mindell, a professional photographer. The contrast of these dramatic yet soft-focus black and white photos with Ms. Sidman’s haiku-like verse makes the book a stunning work of art. Although it is hard to pick a favorite among many wonderful poems in the book, I think the one that resonates most with me is called “The Splash of Your Heart.” I want to/gather you back/midair/that handful of puppy/you once were/keep you curled/in my palm/never hear the splash/of your heart/hitting the world. Another favorite, “Dog in Bed,” concludes: This is how it is with love./Once invited,/it steps in gently,/circles twice,/and takes up as much space/as you will give it. The poems are simple, direct, and heartfelt, and the author’s keen observations of her dog definitely describe “the world according to dog.” A wonderful gift for dog friends or just to savor for yourself! 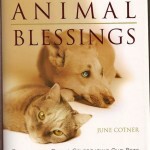 Animal Blessings – Recommended gift book! 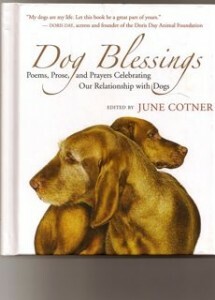 Posted in Animal prayers and blessings, dog poetry, Favorite dog books, pet loss, Pet memorials | Comments Off on Animal Blessings – Recommended gift book! A few years ago, my veterinarian began taking a digital photo of each patient. The photo became part of the pet’s record, printing out on the bills and progress reports during our all-too-frequent vet visits during Emily’s last years. Emily was camera-shy, and the photo is a bit blurry as Emily turned her head away. 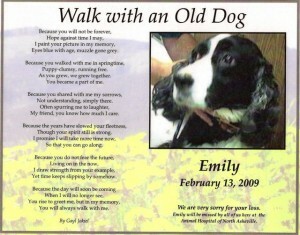 As a final thoughtful gesture after Emily died, the vet mailed me a laminated keepsake of Emily’s photo, along with a comforting poem. Following the loss of Byron in 2007, I began a morning ritual to connect with his spirit. Standing on my back porch, I could see the Dog Star Sirius in the early morning sky. I would take a few moments in the quiet of the dawn to look up at the star and remember him. I had a strong feeling he was watching over me, and this simple ritual was comforting. 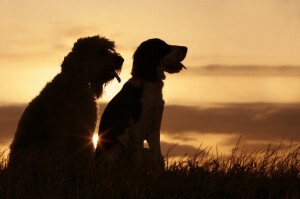 Dog Blessings – recommended book!